MMD National Secretary Raphael Nakachinda says UPND Members of Parliament are afraid to ask Cabinet Ministers to pursue development for fear of expulsion. Mr. Nakachinda says politics of hate should not be tolerated by any well meaning Zambian. 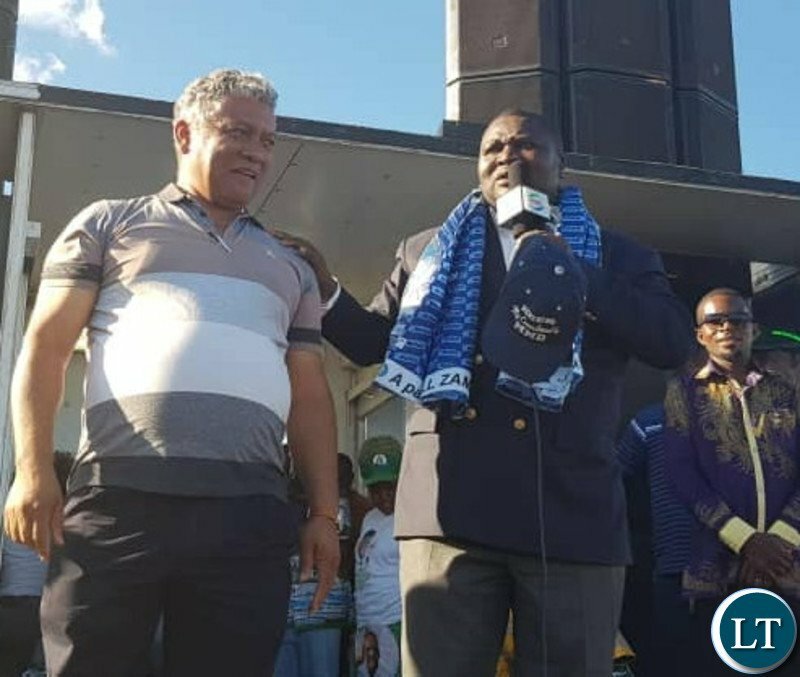 Mr. Nakachinda who joined the Alliance partners Patriotic Front PF and Republican President Edgar Lungu for a rally to drum up support for Kafue Council Chairperson elections said people should be upset with political parties that are promoting divisions in the country. He said UPND MPs are finding it difficult to approach ministers to pursue development projects due to fear of being expelled from their party. He accused UPND president of terrorizing his MPs to the extent that they fear even interacting with MPs from PF or MMD because they are scared that they would be accused of wanting to defect. Mr. Nakachinda said the politics of HH are that of hatred and when you ask my colleagues why they don’t want to interact with you they will tell you that we are told not to associate with you, he doesn’t want us to work with you people to bring development. He said the UPND MPs have confessed that they also want development in their areas but he tells them not to ask for their share of development from the President or Cabinet ministers. Mr. Nakachinda said the Movement for Multi party Democracy have weighed in on the campaign trail of the council by-election in Kafue that was necessitated by the expulsion of the UPND council chairperson during his civic duties for accompanying the President in a cleaning exercise. Previous articleHamukale warns against poaching in Monze’s Lochinvar national park. Raphael Nakachinda another one know enjoying the fruits of Old man Sata’s sweat…now he has been bribed with a salary he can sing for his master Lazy Lungu and pretend to MMD like Mutati…they have no shame at all. It has to take even alliance for council elections? The Delusional Dictator and his cult are a danger to society. They spend all day online making multiple comments and calling everyone dull and uneducated and yet they have spent the last 20 years being led by a loser. Their demigod finger points who should lead, never had a single election in their party and they have the audacity to label ECL dictator. Good thing is formal education is not a measure of intelligence. He doesn’t even want ECL to develop this thing. So Nakachinda in saying in short that developement can only happen if the UPND side with the PF? monies used for developement are not from a party but from tax payers. @KUBWEKA, the answer to your question is YEEEEEEEESSSSSSSSS!!!!! The ruling party in gvt decides how to use the Tax payers money. If you chose the others , let them develop your areas. Fo instance why should we go develop Sesheke where they sent bees on us and hammered us with strange lightening!!!! Sorry…..we are not going to help them. They can go ask the UPND for deveopment and relief food and wait until 2072 when the upnd will be in power. ….and who are the custodians of that taxpayers money?? Isn’t why we vote for a government??? Just look at the dull responses above from the usual suspects although some changed their names, they know no difference between govt and political, taxpayers money and PF money…this mentality is the one breeding cadre power!! UPND fellows claim to be educated but their reasoning is somewhat questionable. Who controls the govt coffers? Bitterness will consume you and 2021 is not tomorrow. Will you manage to be bitter all the way? the kafue by election is because HH fired cc for having accompanied Ecl during cleaning exercise. this is serious and proper backward politicking. l don’t believe it. why has not fired cc for chibombo for accompanying ecl during MFEZ launch? UPND is HH and HH is UPND. He has now become a perfect TYRANT. Allow them to work with the government of the day to accelerate development. Why behave like you own them? With what money, you morons have over borrowed to an extent where all projects are stalling due to luck of funds, to fix the mess that you brain less mother fckuers will take another 100 yrs, by the way is not paying govt workers development in your tu ma shallow small brains? Is HH as terrible as most people paint him? Unpatriotic, heartless, Self Centred, downright capitalist, satanist, tribalist etc? I do not believe so.I thought the man is God fearing and very patriotic to this country. Give him an opportunity to lead this country. The man is very sharp and intelligent. We will all smile and be happy . Give him your mother so he can produce another idyoit like you. We can’t risk giving the steering to an oval head full of hatred and bitterness. Not zambia..thankyou. Let him create zambian Shoprites, Pick & Pay, Choppies and Nandos. MPs are there to represent the people by presenting their aspirations before parliament so that they can be budged for. UPND MPs are not doing that. Kim stop behaving as if you have never been to school, why do we vote for Mps! Nakachinda was once a respected person, but now ,unless quoted wrongly by the paper , is extremely useless and lacks political maturity. Speak about your MMD and PF and perhaps ECL will give you some appointment. Yes you are hungry but do not embarass yiour family by speaking senseless things. the dullness of the pf /mmd alliance is too much. you people of kafue roan and bahati rubbish such kind of political approach where there is nothing that will bring to your areas. bribes of pizzas what can that give you. in short eat and refuse them your votes. Nakachinda.another boot licker.You think all Zambians are blind fools,may be you can fools some with your bullkish farytale..Thus why HH has offered to build a house to anyone with envidence that he sold the mines as you try paint him black..But up to now the whole bunch of liars have not come forth to prove. Sadly, these days , no one even to hear that this so and so is T0nga because they immediately link them to UPND and HH, its that bad. Even the T0ngas, themselves deep down their hearts know that HH has diminished the dreams and hopes of integration with the rest of the country. Until they gain courage, strength and deep sense of knowing, they shall forever fill inferior and alienated from everything! HH doesnt need painting. He has sold himself as a liar, hateful person, catalyst to the current strife in the country. I sincerely believe that he has hijacked the country. He could be giving some of us reasons why we should be considering him but alas he is doing the opposite. Maybe anga peme aka nkala president I doubt. NO THE PF PAINTED HIM AS A LIAR SO THAT THEY CAN GET VOTED INTO POWER AGAIN IN ORDER TO LOOT MONEY AGAIN —— !!!!!!!!!!!!!!!!!!! So, that’s what happened to Nakachinda’s boss Felix Mutati after pursuing development agenda he got fired by Lungu. Bizzare, Mutati’s bad fate ushered Nakachinda as nominated MP, now crawling and bowing to PF agenda. What an expendable human being! Its true HH is so BITTER.This attitude has spread like bushfires into UPND supporters.As long as PF exists UPND stooges ,gets more and more BITTER and HATRED such that they can’t work or hear name of ECL. Sad truth is that bitterness has engulfed even three quarters of UPND MPs .They can’t work with PF government.Working with PF government is tantamount to treason,its a great sin for all UPND stooges including their Ayatollah. Not so much opposition but hopeless vision! They are blind to reality, you must at least love your country to be a democrat. They only see their ambitions fulfilled but offer people nothing but insults. Horrid people, unzambian. In true Democratic nation development is done any where regardless of political party holding that seat. After all an MP’s job is to make laws, amend laws and to repeal laws. Govt’s duty is to look after the affairs of the entire nation without political biasness. Another thing does our govt respect the rule of law? Why are they still calling Mutati and Nakacinda as MMD officials. Don’t the people in PF government know that they will have to account for the money they think is theirs. That rotten cabinet is out of touch with reality and it is responsible for the most horrific decisions negatively affecting many. Tell the people something better other than attacking one man, people are suffering now with many still waiting for their pay. The story of HH this and that is getting old and annoying when people know it’s you ministers enjoying and untightening your belts while they tighten theirs. It’s like still a very big challenge to understand the mandates of the three arms of government especially with regard to execution of developmental projects! MP’s through parliament make laws that protect governance and the executive drives the development agenda while the judiciary ensures observance of the law and its supremacy. So why should MP’s be reduced to begging the executive branch? People talk sense only those from pf talk nosense.Countrymen is Edgar still humble man ?